This book by renowned stereoview collector Russell Norton contains 50 full size stereoviews from the early in the history of the United States. It has a spiral binding to make it viewable with a stereoscope or with a lorgnette. Some people find the excitement of acquisition the best part of collecting stereo images while others will describe in detail a lucrative sale or their latest shrewd trade. But unlike most other types of collectible images, stereoviews have an interactive potential that can make just viewing and enjoying them the central motivation and delight. While this impulse has the effect of preserving many of the best views in personal collections unexposed to the market, it also means that any sharing of these unique images can happen only through visits to collector's homes or by publication of the views an all too rare event. 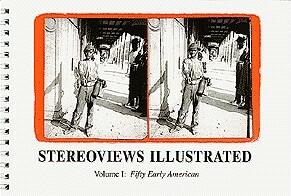 STEREOVIEWS ILLUSTRATED Volume 1. Fifty Early American is the somewhat less than catchy title for a wide-ranging collection of gems assembled by Russell Norton and introduced at the June NSA convention in Milwaukee, WI. A title something like The Joy of Stereography would more accurately describe the visual delight provided by these 50 unique windows on 19th Century American Life. As the author explains in his preface: '. 'This is a picture book. The whimsical selection presented here is from my personal collection and is a sharing and celebration of twenty years in pursuit of meaningful stereoviews." Reproduced full size one to a page, the views are presented in general categories by subject, arranged alphabetically. Under each view is the original caption, the photographer and/or publisher. the date, any text from the back of the card, and an occasional explanation of the subject. People, curiosities and historical scenes dominate this collector's collection, with images that range from African-American farmers to a cat who survived the Chicago fire to Walt Whitman. In effect, the sequence of subjects is completely random since most of the categories are represented by only one or two views. A close-up of some large hail stones from an 1870 storm in Northampton, MA is followed by a view of a murderer's body being dissected in a Dartmouth classroom. A George Barker view of people seated around a table in an open sided shack made of debris from the Johnstown flood is one of the most memorable images of that calamity, while an Anthony view on the facing page invites one into a 'Gipsy Camp" fortune telling tent (operated by 'Prof. Nixon'?!) in Saratoga Springs, NY. The delightful anarchy of images will prove to any doubter that stereoviews can go far beyond faded scenics or boring statuary. There are individual views shown that some people would probably give about anything to have. The 1869 "Fairy Queen" steam driven horseless carriage view (probably by C.M. Clough) and the Crowell view of temperance protesters seated outside an Ohio saloon are no doubt among them, along with the railroad and Civil War views and the anonymous view of a lynching victim dangling above a Silverton, CO creek. For the morbidly curious, dollar value estimates are given at the back of the book with the notation "(no, they are not for sale!)" and an indication of how condition, esthetics, impact, subject, and rarity affects the value of each view. The quality of the 250 line duotone reproduction is enough to make it look as if original views had been left laying on some of the pages. While logos and titles are too dark to read on a few of the views, the images are all sharp and clear with no loss of highlight or shadow detail. The half-tone dots are somewhat hard to notice even with a magnifying viewer, and were created through a screen in a process camera rather than on a scanner. A wire binding allows pages to lie flat for proper fusion of the views, adding to the elements, that place STEREOVIEWS ILLUSTRATED among the all-too-few books that demonstrate exactly how stereos should be published. Aimed at stereo collectors and photographers, the book comes with no viewer but later volumes in the anticipated series will include viewers for a more widely targeted audience. Topics covered by the individual volumes will include: The Civil War, The Old West, Later American, Early International, African-Americans, Native Americans and Early English Groups.